Good morning, I hope everyone has been enjoying their weekend so far. Its been busy, but I have. 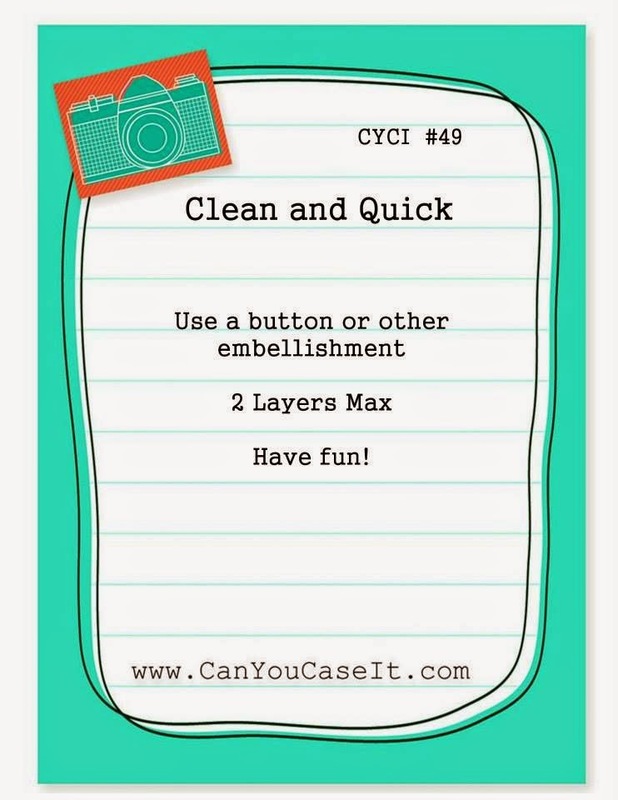 Today I am over at Can You Case It?, and this week our challenge for you is to create and Clean and Quick card using a button or other embellishment with a max of 2 layers. I hope you decide to play along, I can't wait to see what you create! You can never have to many "Thank You" cards on hand so for the next few cards you will be seeing on my blog will be "thank you" cards. I cut a 1"x5-1/2" piece of DSP from the flower pot collection to add a little pattern down the side of my whisper white layer. I used the splatter spots from the gorgeous grunge stamp set in crushed curry and garden green ink. Now the night of navy "thanks" you see is a new sneak peek item! Oh YES, there is a new word thinlit set coming in the new Stampin' Up! Spring Occasions Catalog. Now I did a little something extra with this card.....something I don't normally do...I cut out an envelope insert in matching DSP! Crazy right?! I can't stand the thought of someone throwing away the DSP, so its why I don't normally do it, but I'll have to be honest and say, I LOVE it! It really makes it look lovely. To finish off my card and keeping with the challenge, I pulled out a button and tied it off with some tangerine tango bakers twine. I hope you have enjoyed my challenge card. Leave some "love" and go check out the other challenge cards from our other design team members.